Please read the Time Timer Black support page, each troubleshooting tip carefully. Many times an issue can be fixed with one of the below mentioned instructions. We ask you to check each step applicable to your unit before contacting your local dealer. Thank you. You should use a brand new AA battery in your Time Timer. Please also ensure the battery is seated correctly with the positive side (with nub) inserted first and the pull ribbon situated underneath the body of the battery. Ensure that the battery pull ribbon does not block either end of the battery! Not familiar with using a Time Timer? The movement of the red disk may not be immediately apparent. Set your timer for 20-40 minutes, if you are a new user, and walk away for at least that amount of time. If the disk is completely gone when you return, your timer is working properly. If your timer is not beeping when time has elapsed, make sure the switch on the back of the unit is set fully to the “ON” position. The unit will only beep when this switch is set fully to the “ON” position. 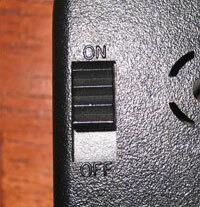 When set to the “OFF” position, the unit should not beep at any time. Note that the unit will always be running when a good battery is inserted. The switch has no impact on the movement of the disk. The Time Timer is not a scientific instrument. With the switch set to the “ON” position, the unit may beep up to 10-20 seconds before the red disk disappears entirely or 10-20 seconds after all the red has gone. This is normal and not considered grounds for replacement. If your unit beeps 1+ minute early, continuously even after time has elapsed, or not at all, skip to the bottom of this page to jump to the replacement request form.The unit may also beep once when set to 59+ minutes. Again, this is normal. The plastic “bump” on the edge of the red disk is held to the disk with adhesive. Sometimes this “bump” can move and restrict the movement of the disk in certain locations. If this happens simply peel it off and re-apply it in a position where this does not occur (see picture). Copyright © 2019 TimeTimer. Powered by WordPress. Theme: Spacious by ThemeGrill.